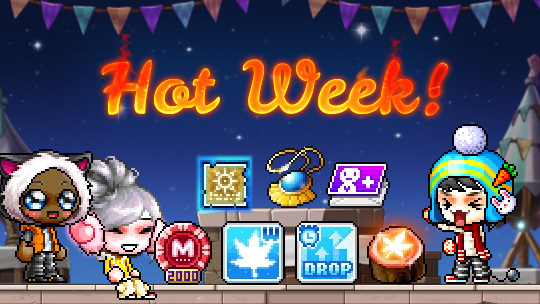 Beginning from today, this week's Hot Days event offers many great items in MapleStory. Once you have a character Lv. 30 or above(Zero characters must have completed up to Chapter 2), you can log in each day and click the gift box icon on the left side of the screen to receive a Gift Box. To open the gifts, double-click the box in your inventory. • 2x EXP Coupon (x3): Untradeable, 7-day duration. Use to receive 2x EXP for 1 hour. • 2000 Reward Points Token: Untradeable, 7-day duration. • Character Slot Expansion Coupon: Untradeable, 7-day duration. • 2x Drop Coupon (x3): Untradeable, 7-day duration. Use to receive 2x Drop for 1 hour. • Pendant of the Spirit: Untradeable, 7-day duration. • Maple Teleport Rock: Untradeable, 7-day duration. • Plus select one additional reward from the items given Monday through Saturday! The Gift Box can be obtained once every day until midnight, and can be opened until 1:00 AM PST (4:00 AM EST / 10:00 AM CET / 8:00 AEDT) of the following day. Event Time: from Monday, February 20 to Sunday, February 26.